Rafa Nadal thumped Canada’s Milos Raonic 6-2 6-2 in the final of the men’s Rogers Cup on Sunday to capture his eighth ATP title this season and boost his confidence ahead of the U.S. Open, starting later this month. Playing in his first tournament since his shock opening-round loss at Wimbledon, Nadal showed he was back to near his best and his ailing body was ready for the grueling demands of the North American hardcourt season. Less than 24 hours after his hard-fought semi-final win over Novak Djokovic on Saturday, Nadal easily beat the dangerous Raonic in just over an hour, playing with all the conviction and freedom of a man near the peak of his powers. 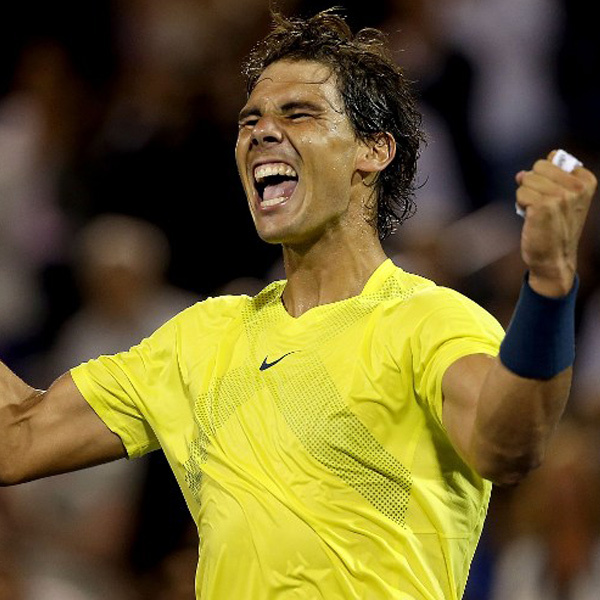 “To win here, I had to be playing my top level,” Nadal told reporters. Sunday’s victory provided Nadal with his third win at the Rogers Cup and his 25th career Masters title and the Spaniard will rise to three in the world rankings when they are released on Monday. Raonic will move into the top 10 for the first time after becoming the first Canadian man in more than half a century to reach the Rogers Cup final. “The breakthroughs I’ve had this week, with everything, from ranking to results, it’s all great things to have happen, especially here at home,” he said. Nadal was ruthless from the outset and never allowed Raonic to settle his nerves in front of a partisan capacity crowd in Montreal. The Canadian’s big first serve, normally one of his most reliable weapons, was nullified by Nadal’s aggressive returns, with the Spanish left-hander twice breaking Raonic’s serve in the opening set. By contrast, Raonic was unable to make any inroads on Nadal’s serve with the fourth seed giving up just one solitary point on serve in the entire first set, which lasted a mere 32 minutes. Raonic fared better in the second set and earned three breaks points but was unable to convert any of them while Nadal capitalized on the two opportunities to get the double break and secure the title after 68 minutes. “At some points, I wasn’t making him play enough,” said Raonic, who enjoyed a hard-fought win over in-form Argentine Juan Martin Del Potro on his way to the decider. “I think I was rushing a lot of the first set and a half. While Nadal’s troublesome knees showed no signs of giving him problems this week, they remain under constant scrutiny, especially when he’s preparing for the U.S. Open, played on the most physically demanding surface of the four grand slam events. But Nadal also won the Indian Wells Masters on hardcourt earlier this year and said he was steadily growing in confidence on the surface. “I am doing things very well…on hard courts,” he said. “Today is an important example that I can play this way in the future.